In recent years, the United Arab Emirates has soared in popularity as a year-round destination for sun-seeking holidaymakers. Once more commonly viewed as a stopover hub – as a place you might spend a few hours while waiting for a flight on to somewhere else – the UAE is fast becoming a prime choice for those seeking a getaway that blends the relaxation of lounging by a pool with sightseeing and luxury shopping. When it comes to food, the UAE is a veritable melting pot of different flavours and cuisine. Its location means the country has benefitted from centuries of cultural exchange, both from its neighbours in bordering countries and from the throngs of traders that have passed through over the years. 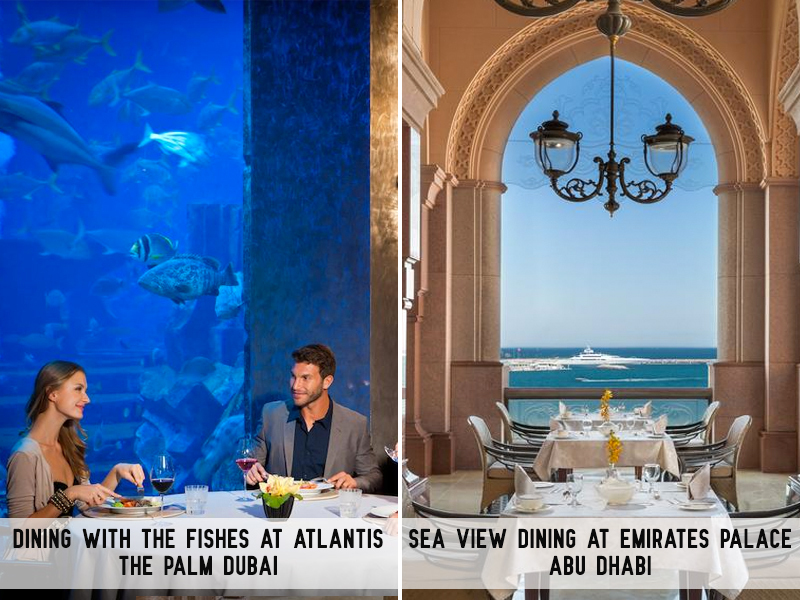 Given the recent surge in development throughout the UAE, there’s a strong choice of diverse restaurants in both Abu Dhabi and Dubai, though it’s possible you’ll find a greater number of high-end eateries in the latter due to Dubai’s overall glitzier character. On the whole, you’ll find your tastebuds equally tempted in both destinations, with local delights such as luqaimat (hot, sweet dumplings), knafeh (a crisp pastry dish featuring sour cheese and sugar syrup), and machboos (a traditional spiced rice dish) readily available, and a host of local and international restaurants awaiting your custom. In terms of accommodation, Dubai boasts a number of iconic luxury hotels where even those with a six-figure annual income might wince at the nightly rate. When the Burj Al Arab opened in 1999, it not only became one of the tallest hotels in the world but one of the most opulent, featuring palatial gold-tinged interiors and sitting on its own purpose-built island just offshore. In the years that have followed, Dubai’s luxury hotel scene has expanded beyond all expectation, with a staggering range of glittering accommodation now available within a relatively small radius. The quieter and more homely city of Abu Dhabi might once have contrasted starkly to Dubai in terms of available holiday abodes, yet an increase in international traffic through the capital has seen an influx of sumptuous resorts in which to spend a thoroughly indulgent break. There’s a lack of consensus as to which city provides the most value for money in terms of accommodation, though it seems the overall cost of a stay might be slightly cheaper in Abu Dhabi. Cost aside, you won’t be short of sumptuous accommodation choices in either city. Dubai is famed for its opulent hotels, glitzy nightlife and high-end shopping. 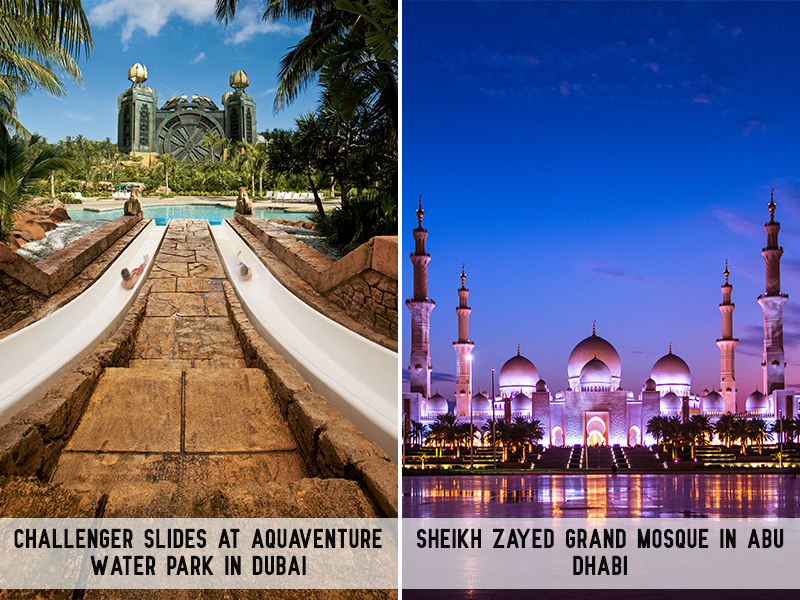 The city’s tourist board also highlights the range of family-friendly attractions on offer such as water parks, rollercoasters and miles of golden sand beaches. In addition, there are a number of cultural attractions and events to enjoy at the various museums, theatres and live music spaces, making the city a multi-faceted place to spend a well-earned break. When compared with Dubai, Abu Dhabi’s attractions might seem less comprehensive – there’s certainly less of a focus on all-out fun and frenetic tourism here, with the city moving at a slightly slower overall pace. That said, there is still plenty to see, with heritage and culture at the forefront of many of the city’s tourist sites. Sheikh Zayed Grand Mosque Center is a must-see, while Saadiyat Island provides a truly stunning beach on which to spend a long and lazy day in the sun. 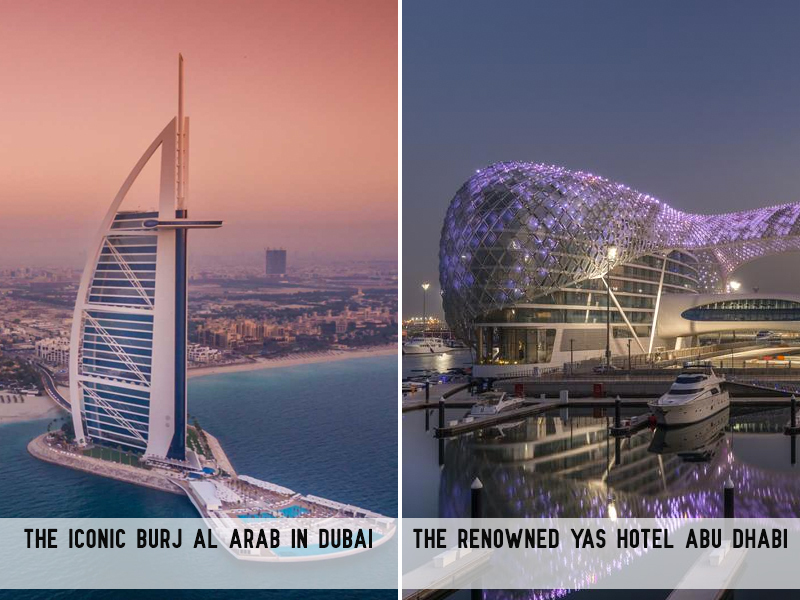 It seems that the UAE’s two most famous cities are pretty evenly pegged in terms of what they offer to visitors. It’s fair to say that Dubai provides a slightly more glamorous experience of the Middle East, with a higher concentration of luxury restaurants and hotels, designer shops, and a greater overall focus on high-end tourism. Abu Dhabi offers visitors an equally refined stay at a slightly slower pace. There’s no shortage of exquisite places to dine or deluxe hotels in which to unwind, yet the focus here is perhaps more on culture and heritage than on decadent stays in Instagram-worthy abodes. What must be highlighted is that the cities are just 1.5 hours apart – and as such can easily work together as a two-centre holiday. With a range of different transportation methods linking these fascinating destinations, why choose between them? A bit of savvy pre-planning will allow you soak up the sights and sounds of both beguiling cities in one fell swoop, sampling the very best the UAE has to offer all in one fantastic holiday.